Many say that the holidays are the season of miracles. ICU baby volunteers see miracles in the NICU every week. One remarkable story of survival, perseverance and love in 2017 is that of Cristiana Esteves and her husband, Sean. 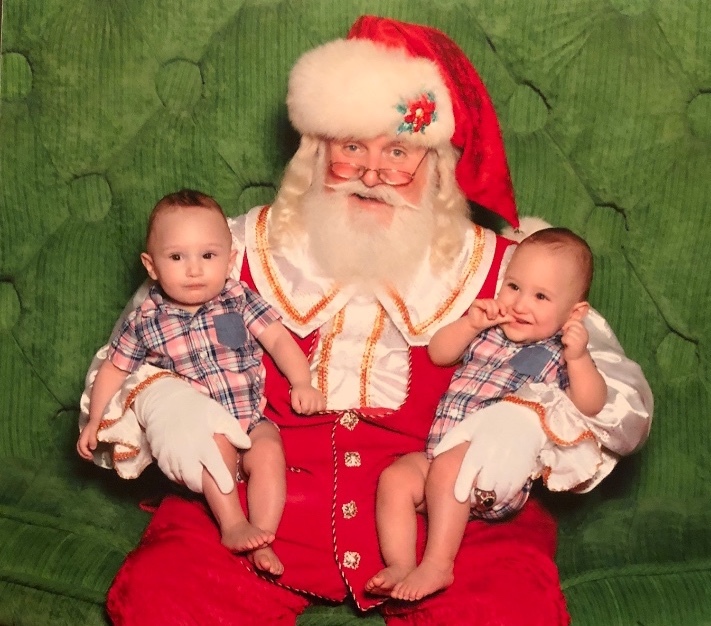 The couple became pregnant with twins after IVF treatments in 2016. What started as a routine pregnancy quickly became one of the couples’ toughest battles. At week 18 of her pregnancy, Cristiana’s water broke. She did not realize, however, until she went to her high-risk doctor for her routine appointment 2 weeks later. The couple’s plan worked and Cristiana was admitted to the hospital just days before the babies turned 23 weeks gestational age. Christmas 2016 for the Esteves Family was spent in the hospital with Cristiana on in-hospital bedrest and Sean by her bedside. At week 29 of pregnancy, Cristiana’s efforts to prolong the twin’s delivery were stopped short. She went into preterm labor and her boys were delivered. She had done it. With the power of prayer, hope and the support of her incredible family, she carried the boys 29 weeks and they both survived birth. The twins were still in great danger. Liam was born at 3 lbs 1 oz. and Axel was born at only 2 lbs 12 ounces. The boys were tiny, but fighters. Three days following their birth, a brief honeymoon period of good health ended and the boys needed to be intubated because of troubled breathing. There began the Esteves’ NICU battle. Liam was the strongest and the biggest. He suffered most complications that preemies have in the NICU, but he came through each time. After two months, Liam was discharged to go home. The news was bittersweet as his brother had to remain in-hospital, as he struggled to survive. It was Axel that would have the toughest fight for life. Axel could not breathe on his own and this did not improve for many months. He continued to require significant oxygen support and the medical team could not figure out why he was unable to breathe on his own, with no progression. Axel was pale and gray, doctors uncertain if or when he would improve. One day, after three months of breathing with assistance, Axel’s luck changed and slowly he was able to be weaned off oxygen. His troubles did not stop there. While he was now able to breath, he wasn’t able to eat. This Christmas, unlike last, Cristiana will not be sitting on hospital bed rest fighting for her little boys. She and Sean will be spending Christmas with them at home knowing that the biggest battle of her life was worth fighting. The Esteves’ already received an early Christmas gift .. at seven months old, Axel drank an entire bottle for the first time on his own just a week ago.